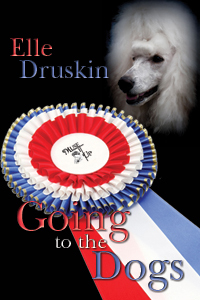 "Elle Druskin has given us a story with teeth, both suspenseful and funny. The interaction is wonderful and engaging. I was unable to put the book down once I began. This is a wonderful find for the romance and animal lover with enough suspense to keep you interested." - Reviewed by Leslie at The Romance Reviews. "I’m not normally a fan of pedigreed dogs. They’re inbred, spoiled and hyper. Give me a mutt from the pound any day. But ya gotta love a dog who eats pizza and Fritos, watches baseball (even if it is the Yankees and not the Cubs), and sings along with the radio. And ya gotta love a cop who looks like George Clooney and bumbles his way through a case involving a dog trainer and her canine clients and their wacky owners. I try to follow a schedule each day—so much time writing, promoting, reading, etc. At night I read a chapter or so and drift off to sleep, often with my Kindle in hand and the light on. At some point my head bobs and I wake up enough to put my Kindle on the bedside table and turn out the light. Not so last night. I read straight through until I finished the book somewhere around five a.m. I highly recommend this book. Just be sure you don’t have anything else scheduled and you don’t have to be anywhere the next day when you pick it up. It’s not a bathtub read unless you don’t mind getting cold and pruny. "- 5 rose review. Reviewed by Rochelle at Rochelle's Romance reviews.